Step back in time, to a world where the rich mingled on beautiful beaches and relaxed under swaying palms. Where celebrities frolicked with high society and created a rarefied world of glamour and intrigue. Since 1928, the Pink Palace has proudly stood as a beacon of style on Florida’s Gulf Coast. The Don CeSar was the playground for America’s elite during the Golden Age of Jazz, where the likes of Clarence Darrow and stars of the silver screen escaped for fun in the sun. F. Scott Fitzgerald visited often, too. We believe his best works were inspired by the property’s rich ambiance. But The Don isn’t just about glamour. It has also proudly served its country. During the Second World War it functioned as a sub-base hospital and convalescent center for airmen returning from battle. It was also a VA Regional Office and recreation center for nearly 30 years. In 1972, a group of preservation-minded investors purchased the Pink Palace and restored it to its former glory as a full-service resort. 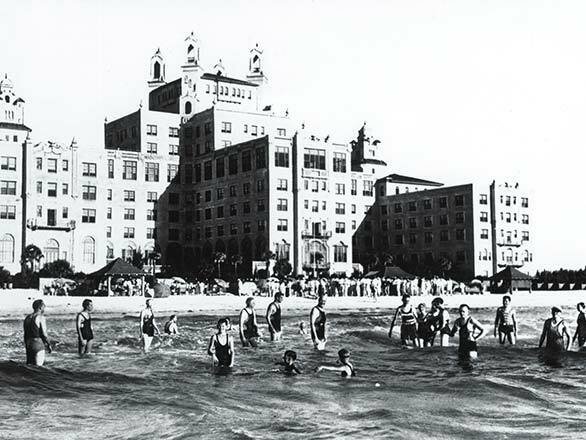 The Don CeSar re-opened in 1973 as the premier destination for those seeking luxury with a dash of nostalgia. The hotel is a founding member of the National Trust of Historic Hotels in America and is listed on the National Register of Historic Places. It was featured in numerous Hollywood movies including Once Upon a Time in America, starring Robert Di Niro and James Woods. It also enjoyed small screen fame, with Tom Petty & The Heartbreakers filming an MTV special here. Even Hulk Hogan got in on the action when he filmed his TV drama “Thunder in Paradise” here. Why not book a stay at the Pink Palace and become part of its legacy, too?